October | 2017 | Nicholas Hoffman & Co.
We recently had an opportunity to spend some time with Ben Bernanke as he was visiting Atlanta. He spoke to a small gathering of financial professionals over lunch. The last time we were with him he was still serving as Chairman of the Federal Reserve and was much more guarded in his comments. This time he was free to speak his mind about the economy, politics, Fed policy, and even baseball. On the economic front, things look pretty good. Growth continues to plug along in what he called “the Rodney Dangerfield recovery” (it gets no respect). Europe is growing faster than the U.S., and they are about three or four years behind us in the cycle, implying they have more room to expand going forward. Japan is doing well. China and emerging markets look pretty good. It’s a goldilocks scenario of synchronized global growth. It won’t last forever, but there is nothing on the immediate horizon that looks ready to derail it. He acknowledged that stock prices are a little high, but nothing crazy. Of course we asked for his views on the direction of interest rates. “I’m not a good forecaster,” he said. “I felt there was upward risk in yields and it hasn’t turned out that way.” Still, he believes the Federal Reserve will hike rates again at its December meeting but he is skeptical whether we’ll see three hikes in 2018 as current guidance suggests. On the political front, he reminded us of the independence of the Fed and the importance of it remaining that way. He believes Yellen should be reappointed. That’s the tradition but even if she is replaced with an inflation hawk, he feels there will be very little difference in the near term. There are 19 members on the Federal Open Market Committee which sets short term rates. It is a consensus organization. Changing one or two people will have little immediate impact. It gets more relevant whenever the next recession arrives. The Fed has very little room to cut interest rates and it remains to be seen if a hawkish Fed chair would be willing to reinstitute extraordinary measures to stimulate the economy. Recession risk appears to be quite low for at least the next 18 months and he believes we are likely to see unemployment fall to around 3.5%. As for risks, he pointed out that we spend 16% of GDP on healthcare in this country and the government pays half of it. That’s much higher than our developed country counterparts, and our outcomes are not as good as others. We’ve got to figure out how to get this under control. It’s not urgent but it’s critical for long term sustainability. And one final thought on our lunch with Ben: the longest economic recovery in our history started in 1854 and lasted a year and a half longer than our current recovery. Dr. Bernanke says we have a good chance to break that record. Let’s hope he’s right about that. 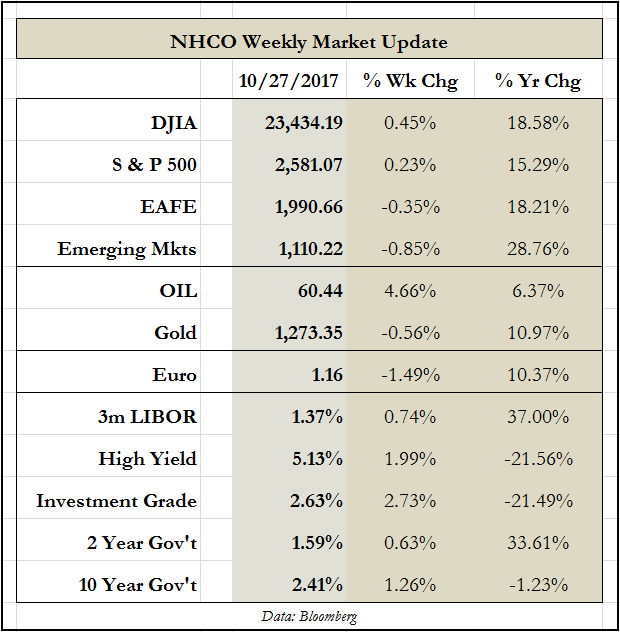 This entry was posted in The Weekly and tagged Federal reserve, interest rates on October 30, 2017 by nhoffmanandco.